We're not bringing backpacks, just day packs, but we'll be prepared. We're avid hikers and snowshoers spending a lot of time in the backcountry. We live in the high desert of Nevada only a few miles from the Sierra Nevada Mountains where a number of peaks that are over 10,000 feet (with caches). 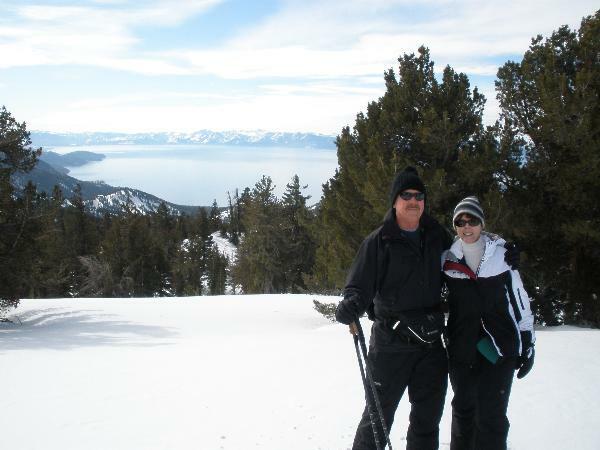 Here is a picture from a snowshoe hike two weeks ago at about 8000 feet. You can see Lake Tahoe in the background. BTW - for planning we've been using Shonky's full topo maps. For the actual trip I have Garmin's City Navigator maps for Australia. Since it is on a card and not the DVD version we can't use it for planning. Long story short - I found the road to Lake Dobson but I didn't spot Russell Falls or Tarn Shelf, at least not on Shonky's maps. Think we'll be skipping Cradle Mountain and Launceston and concentrate on the areas south. Mackenzie, Johnstohn and Backhouse Tarns make up Tarn Shelf, but even walking to the southern start of them will give you great views. Pick a sunny summer day if you can! Next week at this time we'll lose a day. We take off on Thrusday the 18th and arrive on Saturday the 20th. Friday the 19th just dissappears into thin air. Friday the 19th just dissappears into thin air. I'm sure you'll feel like you got an extra day or two sitting there on the plane for umpteen hours! We fly from Reno, Nevada to Los Angeles, then from Los Angeles to Sydney, Sydney to Melbourne and then Melbourne to Hobart. Between lay overs and air time my wife figured out the travel time is 28 hours. Wow. That is quite the haul. Well, if you don't sleep the three days here, you'll sleep 6 when you get back home!!! First order of business when we arrive, after we check in, is to find groceries and a place to eat Saturday night (presumming we're hungry). Sunday my wife wants to head to the Coal Valley area to visit some wineries. Monday's tenative plan is to head up to Wine Glass Bay. We're trying to avoid downtown Hobart the first few days until I get semi used to driving on the left side. Be very careful on the drive up to Wine Glass Bay. It is a lovely drive, but the road needs your full attention as it is NOT a 4 lane highway and it twists and turns through the hills.